Over the past decade, both recreational and medical marijuana use in the United States has grown tremendously.1 However, disputes surrounding the legal and ethical implications, safe administration, dispensing, health consequences, and therapeutic indications– albeit based on very limited clinical data– related to its usage abound. Medical marijuana has gained traction specifically in patients with cancer to treat a variety of adverse effects associated with treatment, such as pain, nausea, and lack of appetite. However, major cancer organizations do not have any standards for marijuana use. With no guidelines, payers have yet to cover it as a treatment, citing this lack of acceptance, insufficient clinical data, and the lack of an FDA-approved product for cancer adverse effects that contains a marijuana-based ingredient. The legal status of marijuana has become increasingly complex. At the federal level, marijuana remains illegal. It is classified as a schedule 1 drug, defined as “drugs, substances, or chemicals with no currently accepted medical use and a high potential for abuse.”3 Other drugs in this class include heroin, lysergic acid diethylamide (LSD), methylenedioxymethamphetamine (ecstasy), methaqualone, and peyote. Despite this, many states have taken matters into their own hands (Figure). To date, marijuana is legal for medical use in 22 states and for both medical and recreational use in 9 states and the District of Columbia. It remains illegal in Idaho, South Dakota, Nebraska, and Kansas. 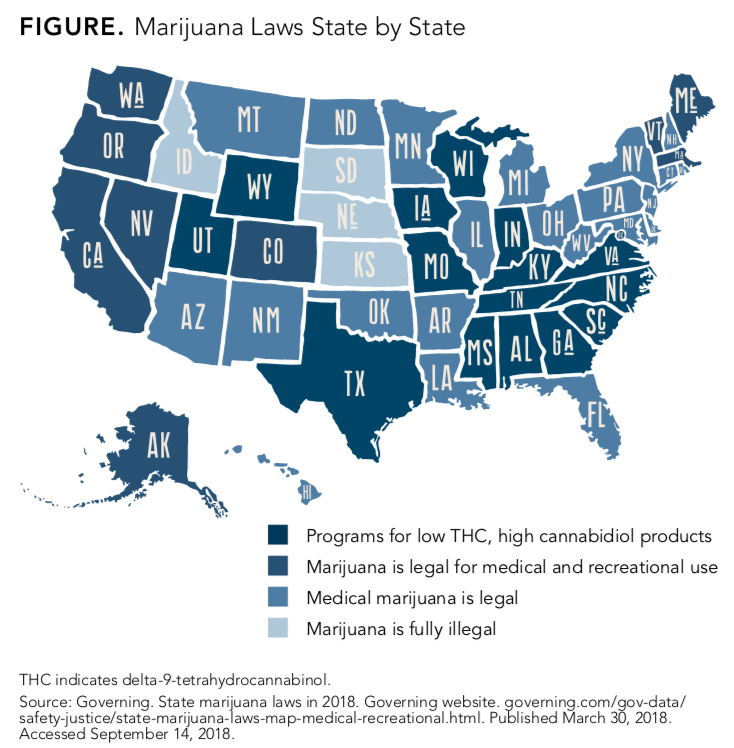 The remaining 15 states have some level of medicinal marijuana legalized, though it is only available as a “low THC, high CBD oil.”4 Scientists have identified many cannabinoids, the biologically active components in marijuana; the 2 most studied are delta-9-tetrahydrocannabinol (THC) and cannabidiol (CBD). The CB2 receptors, primarily found in peripheral tissues on cells in the immune system, hematopoietic systems, and the spleen may play a role in the immune-suppressive activity of cannabis.6 Some research has even suggested that it may contain anticancer properties. In mouse models, cannabinoid administration was observed to reduce the expression of vascular endothelial growth factor and its receptors, leading to inhibition of angiogenesis. In another study involving mice, adding THC to temozolomide reinstated glioma suppression in tumors that had become resistant to chemotherapy. Cannabinoids also have anti-inflammatory and antioxidant properties that are beneficial in combatting cancer specifically,6 although these studies were performed in laboratories with animal models rather than in human models. The effects an individual feels from marijuana also depend on how the compounds enter the body. When taken by mouth, such as in baked goods, THC can take hours to be fully absorbed. Once that occurs, marijuana is processed by the liver, which produces a second psychoactive compound, CBD, that acts on the brain and changes mood or consciousness. When marijuana is smoked or vaporized, THC enters the bloodstream and reaches the brain very quickly. The second psychoactive compound, CBD, is produced in small amounts, with fewer effects.7 Medvedovsky discourages smoking because of the possibility of toxins and encourages vaping instead, although he finds that most patients still inhale by smoking. In the United States, an estimated 1,735,350 people will be diagnosed with cancer this year.8 Although nearly every state that has laws surrounding medical marijuana identifies cancer as a qualifying condition, little research has been conducted to support its use in oncology. In a study published in the Journal of Clinical Oncology in July 20189, researchers hypothesized that the discrepancy between medical marijuana laws and scientific evidence posed a clinical challenge for oncologists. The study authors mailed a survey to 400 medical oncologists across the nation that included questions surrounding whether physicians reported discussing medical marijuana with patients, recommended it clinically within the past year, or felt sufficiently informed to make such recommendations. Researchers found that while only 30% of oncologists felt sufficiently informed to make recommendations regarding medical marijuana, nearly 80% conducted discussions about the treatment and 46% recommended it clinically. These findings shed light on critical gaps in research, medical education, and policies regarding medical marijuana. By contrast, the American Cancer Society stated that it supports the need for more scientific research around the treatments. Some cancer groups provide guidelines10 about how to administer the treatment to patients, but none has taken a stand to say it explicitly approves of or disapproves of the treatment. This can lead to confusion not only for patients and their oncologists, but for payers as well. “We know that THC helps patients with nausea and appetite, which is why cancer patients receive the FDA-approved drug Marinol,” Medvedovsky noted. “In my experience and from the cancer patients I have treated with cannabis, there was no negative effect of medical marijuana on their cancer treatment. It is usually the opposite—so many patients suffer with nausea, poor appetite, pain, depression, insomnia— and the medications they are prescribed are challenging to tolerate because of the nausea,” he said. “Cannabis allows patients to medicate naturally and find almost immediate relief of nausea symptoms during or after chemotherapy, improve appetite, sleep, mood, energy, and pain control naturally.” He noted the emerging evidence of anti-cancer properties as well.